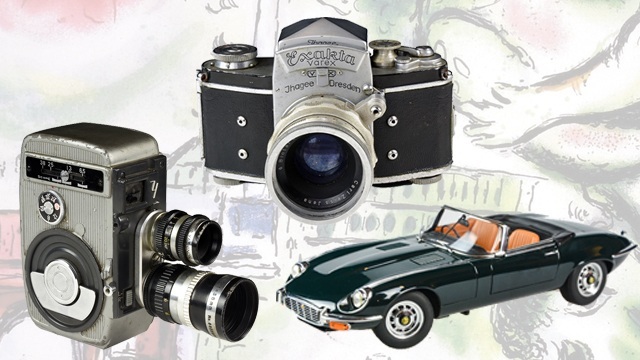 Catch it until July 31 at the NCCA Gallery. (SPOT.ph) What do you remember with the word “tagay”? Probably drunken nights with friends, a heart-to-heart talk with a confidant, or an endless session of fun and laughter in between shots. 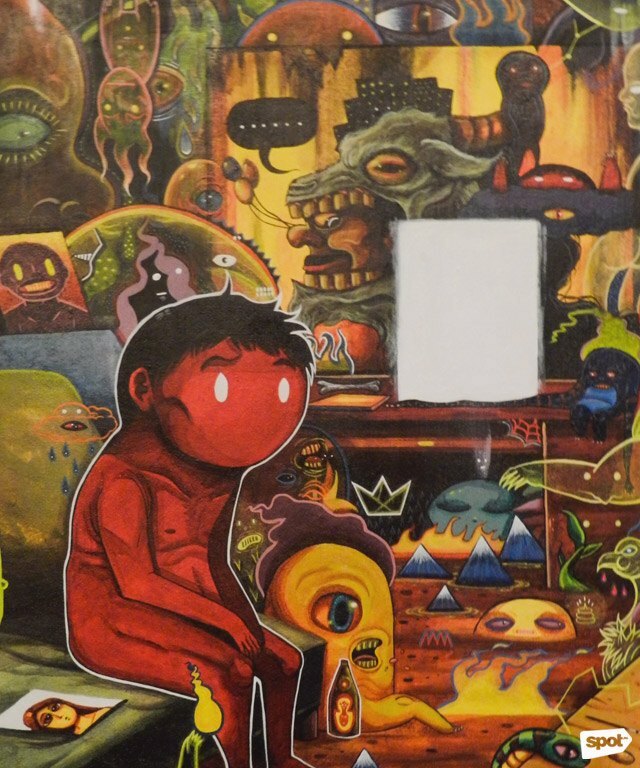 A young group of artists hopes to explore those moments in their latest exhibit titled Tagay Stories, which runs until July 31 at the NCCA Gallery in Intramuros, Manila. It surveys the works of contemporary artists Ronyel Compra, Daot, Golda King, Kenichi Wani, Leonard Thomas Jopson, Lean Luis Borja, and Mark "Kidlat" Copino, who all hail from Cebu City. Cebuanos are known for their tagay culture, a form of social interaction. It usually involves sharing a single glass filled with alcohol by the tanggero, a person assigned to make sure that everyone gets their share of whisky, rum, or beer—basically anything that could make you dead drunk. This task is usually delegated to someone whose alcohol tolerance is higher than the rest since it also involves checking if someone is taking too long to drink their shot. Since the practice is dependent on its use of a shared glass, participants submit themselves to vulnerabilities—risking hygiene, health issues, and all sorts of things that could happen when everyone in the group is drunk. This is exactly what these artists would like to convey—the act of submission in showing a piece of yourself, through art, to contribute to a cultural union. It begins with Ronyel Compra’s "Hinagiban ni Lola” series, made using a technique called luta, which bears some semblance to printmaking. “Hinagiban ni Lola” means “grandmother’s weapon,” so it’s only apt that Compra created the piece by placing a cleaver underneath a piece of cloth and rubbing the cloth over soil. 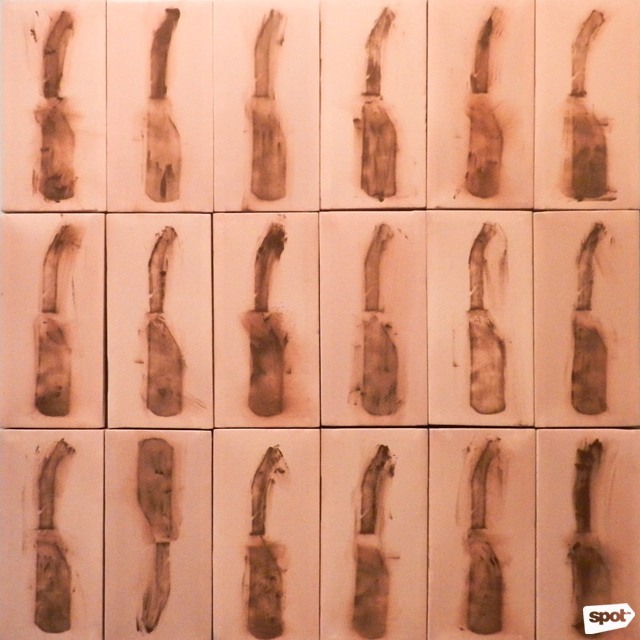 This resulted in a detailed image of the object with a rough but bold texture. 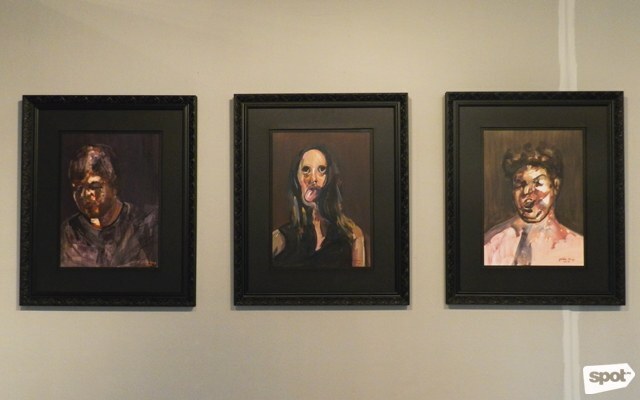 On another wall, Golda King’s works remind us of Francis Bacon’s distorted portraits. They’re all named after phrases that are often said in a drunken stupor—"I Don't Think I Could Ever Love You", "Enjoy the Ride", and "Seriously? 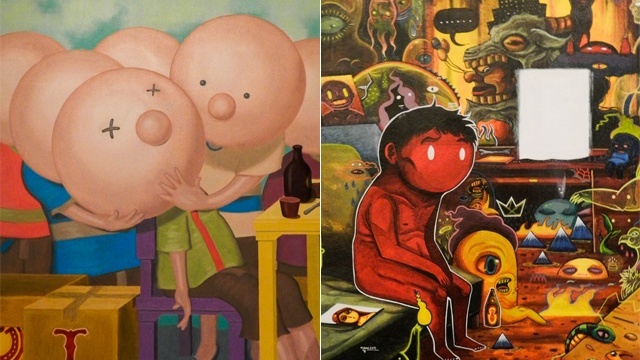 !” Each piece shows a deformed face, which can either be interpreted as humorous or melodramatic. Meanwhile, artist Leonard Thomas Jopson illustrates scenarios which border on fantasy and grotesque. 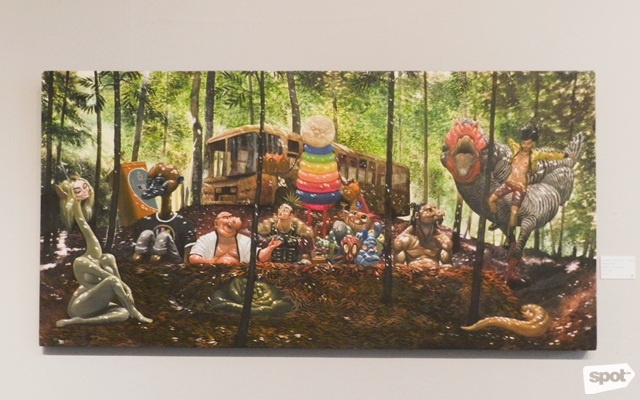 In "Bahala Na," creatures in the middle of a forest are immersed in their own discussion, as if having their own tagayan. Another artist who goes only by the name Daot painted surreal images in various perspectives and angles, presenting a 3D-like rendition of an otherwise flat canvas. 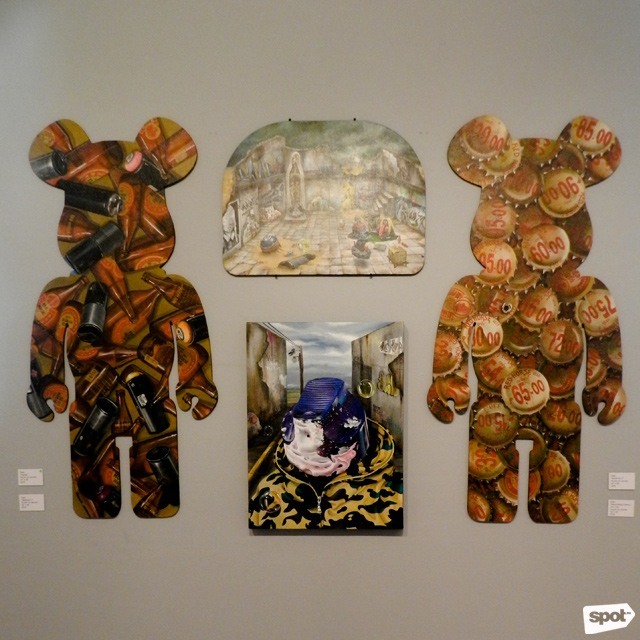 The small paintings are surrounded by two bear-like figures with patterns of beer bottles, with imagery often associated with alcohol. Filipino-Japanese artist Kenichi Wani is known for depicting his subjects with big round faces and a cartoon-like quality. For Tagay Stories, he paints a picture familiar to all drinkers—that moment when the sober one looks after the friend who passed out. In his piece, someone is about to fall from a chair, probably because he was too drunk. His friends hold his head to avoid the fall. The piece reminds us that, in situations like this, we learn the value of trust more than we think we could. 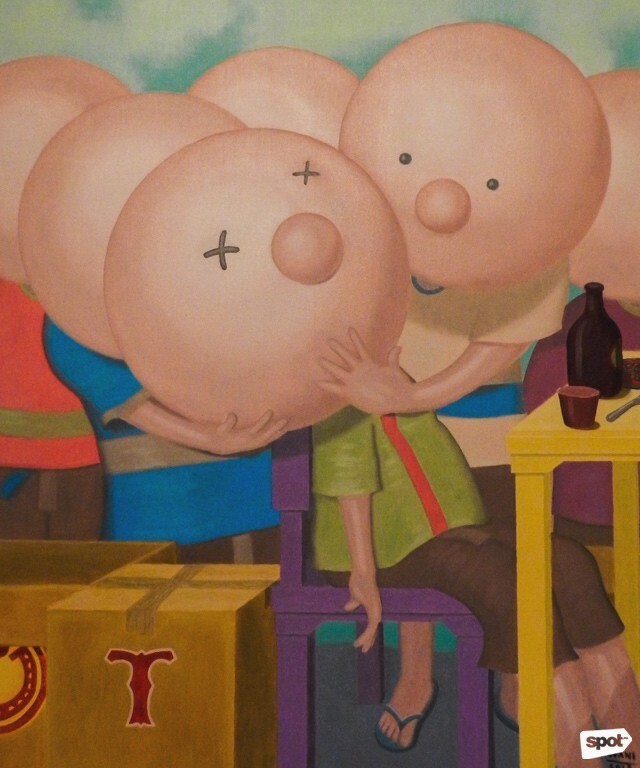 Ironically, Lean Luis Borja’s "A Room Full of Hope" depicts the opposite. A man is alone inside his room, except for a bottle of beer on the floor and imaginary creatures behind him. The picture suggests the varying degrees of emotion we experience when we face our personal issues head on (or with some help from alcohol). 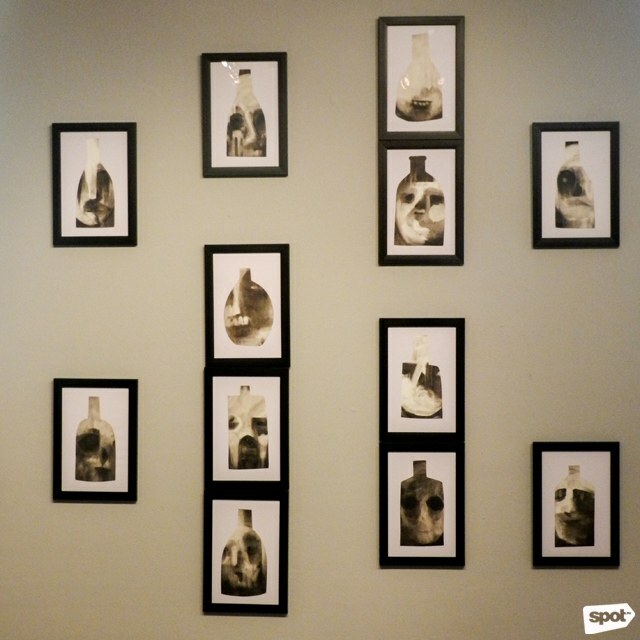 Next to Borja’s works are Mark "Kidlat" Copino’s paintings that resemble jars with different faces on them. Each unsettling image gives an uncanny feeling to the viewer, as if showing us our vulnerable selves that come out when we are under the influence of alcohol. 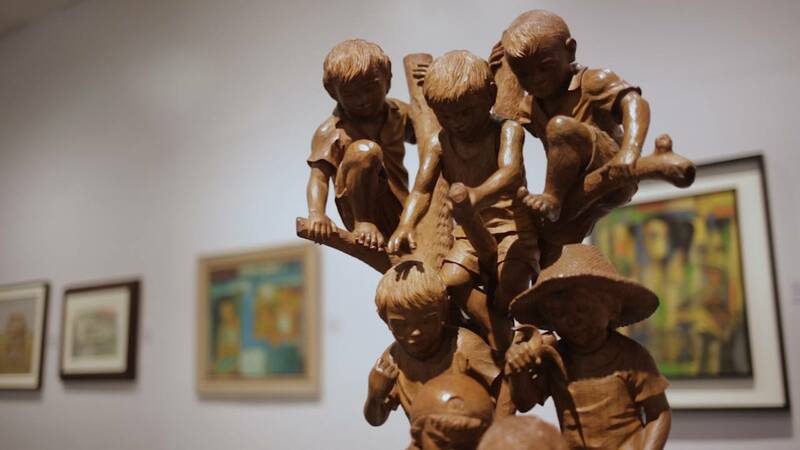 Tagay Stories runs until July 31 at NCCA Gallery, 633 Gen. Luna Street, Intramuros Manila. For more information, visit NCCA’s website.